hackenslash: What's In A Name? A rose by any other name would smell as sweet, but what would a turd smell like if you called it a cupcake? The great bard, as he often did, exposed great weaknesses in our thinking when dealing with how we name things and what those names bring to mind. 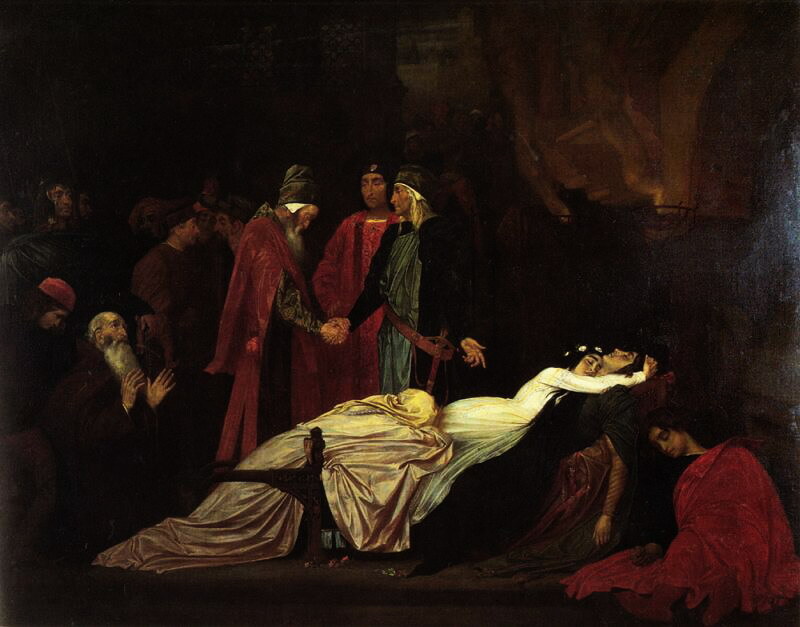 Romeo and Juliet, ostensibly a fairly straightforward story of love, sacrifice, loyalty and pride, deals quite harshly with the labels we put on things, to the extent that those labels lead to heartache, death and what some would call betrayal. Here, I want to talk about nomenclature, because it's so deeply embedded in the way we think about things that it's really difficult to separate people from their labels, and even harder to separate definitions. Moreover, exploring this subject should provide some insight into the way that we use language, how we think about things, and why it's important to drill down to the semantic content of an argument. It will, of necessity, include some ground already covered. We've previously looked at the importance of semantics and how it gives clarity, as well as when it's misapplied to derail discussions. We discussed at length how definitions can be fluid, and that we each carry with us our own sense of what a word means. There are areas in which definitions are not and cannot be allowed to be fluid, and they can cause some confusion if care isn't taken. You can think of this offering as a glossary, of sorts, as what I really want to do is to address the way that some terms tend to be used in the vernacular versus the way they're used in philosophy and the sciences. That words have technical usage that tends to be quite rigid is hardly surprising. When we read, for example, a scientific paper, it's important for anybody reviewing to be clear what is meant by all the terms without every paper having to include a glossary detailing how all the terms are used in the paper. This would make primary literature even more unwieldy than it already is, and it would slow progress. I've come across arguments before that scientific papers are obscurantist, using terms in esoteric ways labelled 'jargon'. While the latter is true, the former isn't, because the reason for having jargon is precisely to avoid obscurantism and obfuscation. Use of precisely defined terms that don't evolve is incredibly important, especially during peer-review, as anything that leads to ambiguity not only means that a paper will have a harder time passing review, that ambiguity can blow out of all proportion when it enters the public sphere. One only need look at the misunderstandings that arise out of the difference between rigorous and vernacular definitions of such terms as 'theory' to see how this can impact public understanding. I've said before that the really important aspect of semantics isn't the debate about what terms mean, and that this is generally little more than a distraction that stymies progress in discussion. The really important aspect is clarity. It doesn't matter even a little bit if I use a term differently to you, or different to common usage or dictionary definitions, what actually matters is that you understand what I mean when I use the term with no risk of ambiguity or equivocation. Let's start with some commonly misunderstood terms that form the hierarchy of scientific epistemology. I'm going to treat these as a single entity here, because it will be instructive to compare them, as there's a lot of misunderstanding about what each is, and what can become what. One of the most common objections to evolution, for example, is that it's 'just a theory' and that it isn't a 'law'. One often comes across the statement that 'I'll accept it when it graduates from theory to law'. This never happens. Indeed, this can never happen, and displays a fundamental misunderstanding. Hopefully, we can resolve this here, along with some other terms. A fact is a data point; something observed to be the case. It's often said that there are no facts in science, but this is incorrect. What that phrase is attempting to convey is the idea that our models aren't final, and that we accept them tentatively as being 'empirically adequate', which simply means that they fit all currently available observations and that no falsifying observations have been made. There are plenty of facts in science and, in fact, they form the foundation of science. As an example, I just let go of a pencil (I didn't; it's a thought experiment). When I did this, it fell to the floor. It is a fact that it fell to the floor. It will always remain a fact, and objectively so, that it fell to the floor. It will never be the case that that pencil didn't fall to the floor when I dropped it. This is what I mean when I say that a fact is a data point. A hypothesis is a guess; an attempt to explain what is observed to be the case. It's essentially a machine for generating predictions about what future observations should reveal if the hypothesis is correct and what, if it is observed, will show the hypothesis to be incorrect. Applying this to our fact above, we might hypothesise that the pencil fell as a result of some force. After all, we know from the laws of motion that a body will continue in its state of motion or remain at rest unless some force acts upon it, so this would seem like a solid guess and, indeed, this was Newton's guess. He called this force 'gravity'*. We might imagine him venturing the postulate that things always fall down when dropped. This would be wrong, of course, and we know of a situation in which this doesn't happen. Luckily, Newton had that covered. A law is a description, usually mathematical, of some observed phenomenon or some relationship between observed quantities. This is another terms that's horribly misunderstood in the public sphere, because it's thought that physical laws are prescriptive; something that must be obeyed without exception. This notion comes, of course, from our understanding of criminal and civil law, which we also think of as prescriptive. Neither is actually prescriptive. What each really is is descriptive. That might sound a bit odd, but they both do the same thing, which is to say 'if you do this, this will be the consequence'. Newton's law of universal gravitation says 'if you have two bodies, the force between them will be equal to the gravitational constant multiplied by the product of their masses, divided by the square of the distance between them. acting on the apple, his law of universal gravitation, and all the observations that he made along the way. In most dictionaries, you'll find a list of synonyms, including things like 'conjecture', 'postulation', 'hunch', etc., none of which apply to the rigorous scientific definition. With a properly constructed, robust definition, there can be no synonyms, because there can only be one term that accurately captures the thing under consideration. Indeed, synonyms are extremely tricky things in any event, because it's pretty rare that two terms are directly synonymous. Most pairs of terms will have subtle differences in common usage, and this is one of those pitfalls of natural language that we've discussed previously. It's also worth pointing out the distinction between evolution and the theory of evolution here, because the two are often conflated with disastrous consequences. Evolution is a fact. It's been observed occurring. Indeed, macroevolution is a fact. The theory of evolution is the integrated explanatory framework encompassing all the facts, hypotheses, laws and observations pertaining to that fact. The theory of evolution could be wrong. It's highly doubtful that it will be shown to be wrong in any significant sense at this point, but there are certainly elements of it that can be shown to be wrong. However, evolution itself cannot be shown to be wrong, because we've seen it occurring at every level predicted by the theory. In any event, anybody who thinks 'it's just a theory' constitutes any kind of valid objection to evolution - a fact - should probably go and have a word with Senkichi Awaya and explain to him that atomic theory is 'just a theory'. Another commonly misused and misunderstood term is 'proof'. In rigorous circles, proof is a formal procedure applicable only to axiomatically founded systems of deductive logic. This means that it's mostly restricted to mathematics, but also to some forms of deductive argument, such as a sound syllogism. By sound, of course, I mean founded on true premises and operating on valid rules of inference. If you have both of these elements in place, then your conclusion cannot fail to be true, so it's proof in the most rigorous sense. The only time this can apply in science is in the negative form, which we term 'falsification', in which we say 'this observation is incompatible with our theory/hypothesis, so it is definitely false'. This is what happened with Newton's theory, namely that observations showed that it couldn't be correct, so it was discarded. In Newton's case, we still use the theory, because there are degrees of incorrectness, and Newton's theory survived so long precisely because it makes sufficiently accurate predictions at the velocities and distances we encounter on a daily basis to be useful, and it's considerably easier to work with than Einstein's field equations. In fact, Einstein himself doubted that any complete solutions to his equations would ever be found, and he thought that we'd only be able to find approximate solutions. It was only a year later that Schwarzschild found exact solutions, and it's those solutions that are the foundation for all black hole physics, with Schwarzschild giving his name to the radius that a given mass must be entirely contained within for escape velocity to exceed light speed, the definition of a black hole. The takeaway here is, of course, that we have to be careful to define our terms, but we also have to be aware that there are disciplines in which all the terms have been robustly defined and are not as fluid as they can be in the vernacular. Leaping onto your preferred definition of a term that somebody else is using, especially in the context of a scientific or philosophical discussion, is a mistake. It's fallacious, and it leads to pointless bickering over irrelevant semantic detail, when the really good stuff lies just beyond, and only requires that you accept the terms as your opponent is using them. Hope some enlightenment was found herein. Share and enjoy. *As an interesting aside, it's commonly thought that we use the term 'gravity' to denote serious matters because they're 'heavy' and that this usage owes its origin to gravity as a force acting upon mass, but this is exactly backwards. † Senkichi Awaya was the Mayor of Hiroshima, killed by the first atomic bomb in 1945.